NFTA #5052 working route 5-Niagara Street from Downtown Buffalo in August, 1979. Sister bus to NFTA #5023, but later production as GM had reoriented the driver's side mirror to facilitate easier adjustment. The second order of RTS-03 buses in 1980 (5066-5078) came equipped with wheelchair lifts and were identified by a large blue wheelchair decal on the right front by the bus number. Photo courtesy of Jim Husing collection. Album name: Bassman / Buffalo/Niagara Falls - Niagara Frontier Trans. Auth. Starting with the 6000-series RTS-04 buses, the wheelchair decal was smaller and placed on the upper right corner above the windshield. 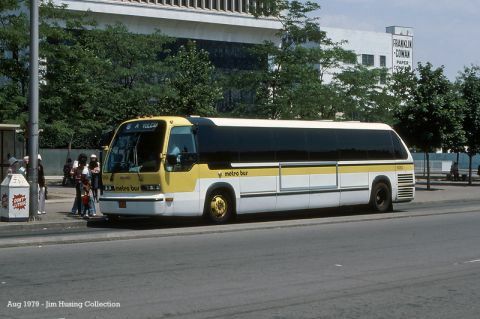 When these buses were repainted in 1988 in the "earth tone" livery, the 1980 buses reflected the same decal.